This region’s soil has a slight tropical acidity, a result of its enrichment by volcanic ashes. 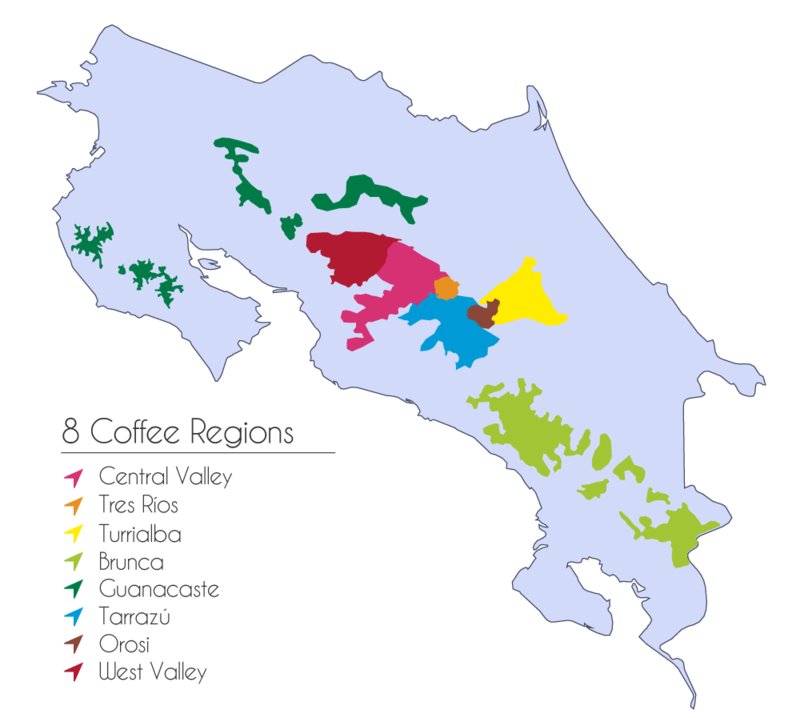 The Central Valley coffee brings a well-balanced cup, cocoa acidity and fruity taste, and body intensity that goes from medium to strong, depending on cultivation altitude. West Valley coffee, which has the most complex flavor of all the regions of the country, is recognized as an excellent full-bodied coffee with sweet and soft aromas like sugar cane, vanilla and dried fruit. Its delicate acidity makes it especially suitable for espresso. Tarrazu is a coffee growing region that has achieved worldwide fame with its own personal seal. The taste is comparable to fruity flavors like prune, apricot, orange and sometimes even lemon. It has diverse aromas and notes of sweet coffee mucilage, flower blossoms and delicate citric nuances. Its acidity is one of the most outstanding attributes, with an aftertaste of completely ripe coffee cherry. The coffee from the Orosi region results in a pleasant-bodied cup with taste of cocoa and floral fragrances, together with an aromatic and noble acidity, all of which brings the unique characteristic balance of its coffee. The coffee from Tres Rios has characteristics that remain equally homogeneous throughout the Region. Volcanic soils rich in organic matter and ideal temperatures produce a full-bodied coffee with brown-sugary sweetness and fine acidity, an extraordinary balance which makes it special for strong body coffee lovers. The Turrialba coffee has pleasant tasting, a soft and delicate aroma easily comparable to the smell of the ripe fruit of the coffee. It brings a fruity taste and an aftertaste with soft woody notes. Its acidity is barely perceptible, giving full prominence to the sweetness. These are coffees from lower and medium altitude areas with very mild taste and a sweet and hints of sugar cane, flowers and citrus fruits. It has a soft aroma with mild acidity, which brings a clean and smooth cup, ideal for light coffee lovers. The coffee from Guanacaste Region is characterized by their elongated shape, easy to roast. It has a light body and a slight acidity, typical bitterness of the mid-altitude Pacific zones’ coffees. It produces a soft sweet aroma with woody notes, resulting in a pleasant, flavorful and balanced cup.